"The lady is out of bullets. Wait here a minute." Although Stan Laurel is today inseparable in the public mind from his work with Oliver Hardy, Laurel in fact had a long and successful film career before he permanently teamed up with Ollie. This second two-disc set from Kino of Laurel's solo work offers a broader perspective over a longer time frame, and shows some of Stan's versatility and provides quite a few surprises along the way. The first grouping, from about 1918, features Stan as a supporting player to Larry Semon in Huns and Hyphens and Frauds and Frenzies. Although his parts are fairly nondescript and could have been done by nearly any of the many silent comics then working, Laurel immediately jumps off the screen with his perfect timing and fluid sense of movement, honed in the Karno music hall act as understudy to Chaplin. What's most intriguing here is the extent to which Semon's wildly creative comedy is highly entertaining; this often maligned figure may be rehabilitated to some extent in the silent audience's minds after seeing this set since the Semon shorts are extremely funny and among the best in the package. Laurel was also doing solo work at this time, for Pathé and Metro. While Just Rolling Along (1918) smacks of imitation of Chaplin's tramp role, Hustling for Health (1919) features a Laurel who is coming into his own. He's almost pushed out of his own picture in Do You Love Your Wife, though he manages a hilarious turn at the finale. 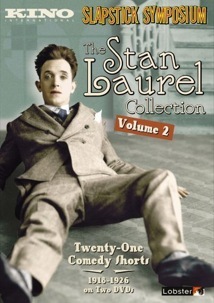 There are some charming parallels between the lives of the poor laborer Stan as Humpty-Dumpty and wealthy swindler Gerald Stone (Colin Kenny) in The Egg (1922), and Stan gets a particularly fun segment when he's called upon to be a labor rabblerouser, and when he gets his chance to orate he spews bizarre nonsense that's cheered wildly by those assembled. Perhaps the best known of the pictures on this set is the Valentino satire Mud and Sand (1922), which features Stan as the bullfight-happy Rhubarb Vaseline. An important part of the famous Stanley character shows up here, as the frustrated Rhubarb scratches the top of his head in one scene in that familiar way—the only time I noticed him doing so during this entire six-hour set. Once Laurel signed with the Roach Studios in 1923, however, he shifted to a far less story-driven form of comedy and began making loosely plotted (if plotted at all) shorts that are just crammed with a series of gags based on the basic setup, rather in the Keystone mold. There are numerous work shorts of this kind, with lumber company (The Noon Whistle), street cleaning (White Wings), coal mining (Pick and Shovel) diner (Short Order) settings working the gags. Stan still was working on parodies, however, with Under Two Jags taking off on the desert adventure Under Two Flags. Another in this series is Rupert of Hee Haw (a satire of the now -forgotten Rupert of Hertzau (itself a sequel to The Prisoner of Zenda, which features Stan in a double role. Things start to look promising in Smithy (1924), which has an encouragingly interesting setup relating to discharge from the post-war military but then quickly devolves into a standard construction knockabout. As Laurel took more of the reins of production at Roach beginning in 1924, his films also obtained more substance, even when they tended to focus on a single setup; Detained could have been an ordinary jail comedy but Laurel gives the gags a nice spin and a natural evolution that keeps things tight and far less scattershot. Mandarin Mix-Up features Stan as a baby in a massive high chair, which anticipates similar setups in the Laurel & Hardy picture Brats. Only in the final short, Get 'Em Young (1926) do we see something similar to the Stanley character, as Laurel not only engages in cross-dressing and cries in that inimitable style. This is an impressive overview that offers plenty of solid laughs from beginning to end, and should help considerably with the appreciation of Stan's solo career, great as his teamup with Hardy would become. Image Transfer Review: The full-frame picture generally looks quite good in these restorations by Lobster Films. Just Rambling Along, with heavy wear, looks the worst but is by no means bad. Some pictures, such as Huns and Hyphens and Short Orders, have some spots that are rather dupey and contrasty but otherwise look crystal clear, indicating that multiple sources were needed for the restorations. The Egg looks terrific, as do most of the films on the second disc. Mud and Sand is rather dark and contrasty. Even though these restorations are from a European source, I'm happy to report a complete absence of ghosting from inadequate conversions. While not quite pristine, these presentations hold up quite well even on a larger screen. Audio Transfer Review: The piano scores (the few of which are actually credited are to Neil Brand and Eric Le Guen) sound superb, with excellent presence throughout. A few of the anonymous scores seem just this side of a needle-drop score, wandering off into their own worlds with little attention seemingly being paid to the onscreen antics, but most of them support the pictures well, without drawing undue attention to themselves. Extras Review: There are no extras, though each disc contains a handy "Play All" button for nonstop Stan fun. Chaptering is thorough, with most shorts getting more than one stop. A fun overview of Stan's solo career, in variable but generally excellent restorations. It's packed with laughs and much of the comedy still holds up very well indeed today.